The IIT Immunology Symposium is an annual event showcasing the world-leading research taking place at this institute within the Royal Free Hospital in Hampstead. 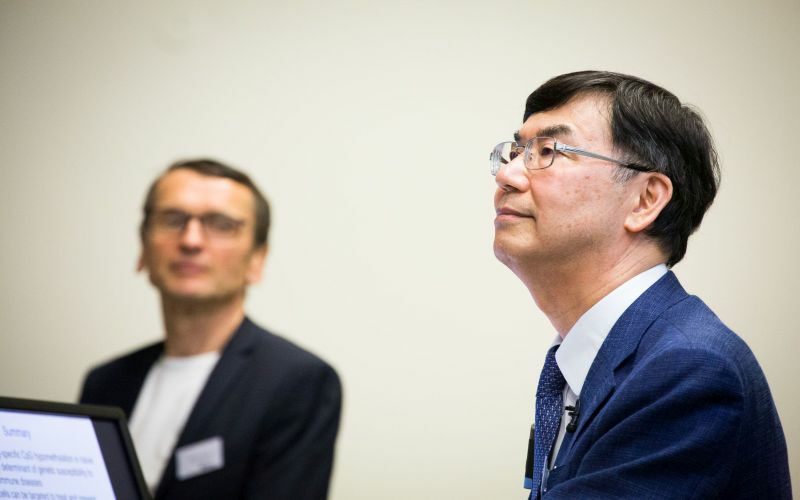 Professor Shimon Sakaguchi, Distinguished Professor at Osaka University in Japan, was the keynote speaker at the 2018 Immunology Symposium held by the UCL Institute of Immunity and Transplantation (IIT) at the Royal Free Hospital on 10 July. He delivered the annual Pears Lecture on the function of regulatory T cells, those cells in our bodies that control the activity of the human immune system. Professor Sakaguchi discovered the regulatory T cells and showed that they are essential for our immune system to protect healthy tissues while eliminating infected cells. The absence of these cells causes severe autoimmune tissue damage in patients with rare inherited defects. His work has provided an extremely important foundation for biomedical researchers around the world. Scientists at the IIT and other research institutions are now developing strategies to use regulatory T cells as ‘life medicine’ for the treatment of patients who suffer from autoimmune disease. This year’s symposium was attended by around 250 biomedical researchers and clinicians at various stages of their careers. A prize was awarded for the best presentation given by an early career researcher. Presentations on the diverse immunology research work carried out at the IIT included improving the body’s acceptance of transplantation, progress on the use of genetic information to develop therapies for patients with inherited immune defects and new approaches to treating hepatitis B. Depending on the clinical condition, the IIT aims to strengthen immunity or create tolerance in the immune system and to treat inherited defects. The institute is going from strength to strength and research teams will move into the purpose-built Pears Building in 2020. This is currently under construction next to the Royal Free Hospital and has been made possible by the fundraising of the Royal Free Charity, which includes securing a generous donation from the Pears Foundation.